Dmitri Rogozin, Russia’s ambassador to NATO, speaks during a news conference at NATO headquarters in Brussels. The World Policy Forum recently held a conference in Yaroslavl titled “The modern state in the age of social diversity.” It has attracted wide the attention of Russians as well as foreign experts and analysts. 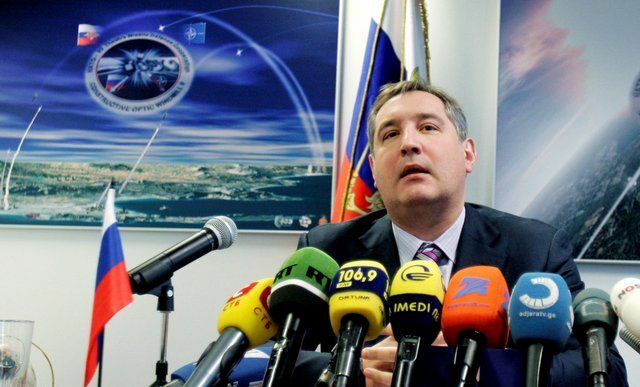 In particular, the speech delivered by Dr. Dimitry Rogozin, the Permanent Representative of Russia to NATO has attracted considerable attention (see here for TOO articles mentioned Rogozin). However, some of the media published the text with large inaccuracies, while others simply ignored it. Therefore, at the request of readers, Arguments of the Week, a public affairs website, has decided to completely and without distortion publish the speech of Dimitry Rogozin (bold-faced type in original). The following is an English translation. Thank you for the invitation Igor [Yurgens] and your kind introduction. The topic, which I now want to touch on, is not directly in the scope of my professional competence, but is relevant to my research, and has my civic interest. It’s about the national question in Europe and Russia. It is now a key domestic challenge and growing threat to the whole Euro-Atlantic space. Currently there is no conflict between Christianity and Islam in Europe, as the European Christian civilization has been artificially weakened by secularism and the leftist “cultural revolution.” Europe’s Muslims have a religiously stronger solidarity than the indigenous population, and they keep their roots, forming pure ethnic neighborhoods. I am now temporarily living and working in Brussels and I can tell you that the local police sometimes do not risk patrolling in the so-called Arab neighborhoods of their capitals. The collapse of European multiculturalism, which has been admitted this year by leaders of the major Western European states, was predicted a decade ago. And not only by critics on the right—conservatives and nationalists, but also liberals, including Seyla Benhabib. In her works, she persistently and persuasively argued that the granting of privileges to ethnic and racial groups contradicts the liberal foundations of Western democracy and is inconsistent with fundamental notions of freedom and equality. Thus, the risk of repetition, “Roman scenario” — the fall of ancient Rome under the onslaught of the barbarian hordes — is no longer an intellectual provocation, but a realistic assessment of the situation prevailing in Western Europe. The Russian situation is somewhat similar to the West, but in some aspects much different. First, like the West, Russia is experiencing an unprecedented immigration pressure. In total volume of immigration, it ranks second in the world after the United States. Unfortunately, that immigration is not justified economically, and is extremely dangerous socially and politically. The problem is Russia has imported almost exclusively unskilled labor on a large scale, which dramatically reduces the incentives for technological modernization of Russian industry and results in an archaic social structure. Uncontrolled immigration entails a significant increase of tensions in Russian cities, challenging the social and political stability of the country. It may be objected: Pardon me, what does multiculturalism have to do with that? Can immigrants in Russia be labeled a “privileged minority”? My answer is: in Russia, some immigrant groups are indeed privileged. They receive preferences for business, forming interconnected and influential ethnic networks. Within the framework of the criminal “division of labor,” they control entire sectors of trade and services, and exert organized pressure on the government and the administration of justice. However, the main line of tension in Russia today is not between, so to speak, citizens of Russia and immigrants, but within Russian society between ethnic groups in the North Caucasus and the Russians. You can easily imagine the level of distress, to learn that, according to the published opinion polls, 50 to 75% of Russian citizens advocate the separation of the North Caucasus — in whole or in part — from the rest of Russia. This is an extremely dangerous trend, aimed at the disintegration of the country. Moreover, carriers of these destructive attitudes are in the most dynamic sections of Russian society: students, businessmen and intellectuals. The reasons for this hostility are well known to the Russian participants of the conference, but for foreigners I briefly enumerate them: since the Yeltsin-era the formal and actual status of the various national republics is higher than the actual Russian regions. These republics have certain preferences and benefits. At the same time people from these republics quite often show disrespect to the people of the central Russian cities; they deliberately violate Russian cultural standards and norms for conventional behavior. Criminal elements, including some with the experience of participation in bandit formations, form a significant part of the most brutal and cynical criminal groups. Privileged ethnic groups and preferred areas are a gross perversion of the principles of the Russian multiculturalism. Or, to paraphrase [George] Orwell, some people are more equal than others. Russians feel that in Russia they are the position of suffering social and ethnic discrimination as a majority; they are acutely aware of their unequal status and experience it deeply. As a result, in Russia the ethnic Russian population began to mobilize. The Russian situation, the Russian question — is the main nerve of contemporary Russian politics, which, unfortunately, many have not yet understood, but is seen by many with fear and anxiety. Meanwhile, the decision of the Russian question critically depends not only on the stability and integrity of the country, as I pointed out earlier, but, without exaggeration, the vector of its historical development. The fact is that the relations between the Russians and the new “preferred minorities” are essentially the relationship between the center and the relatively less modernized periphery. The historical choice is: either the periphery will subordinate and barbarize the center or the center will facilitate the upgrade of the periphery. Historically, both quantitatively and qualitatively the Russians are the driving force behind the country’s modernization and the modernization of its nucleus, and they historically bear the primary responsibility of uniting the peoples of Russia. Is it possible to unleash, and not to cut the knot, which sprang up in Russia? As a Russian citizen, as an ethnic Russian, as a politician, a patriot of my country, I am convinced that such a path exists. First: Russian civil equality. Especially for the fearful and hard of hearing: it is not about some privileges and advantages for the Russians, but about equality and justice. Equal rights for Russian civilians and justice for all — that’s the main demand of the Russian people and the requirement of all Russian patriots. Are the principles of equality and fairness something offensive and humiliating to other nations, or against their interests? The second principle: the rejection of the perversion of the principles of multiculturalism and pseudo-tolerance. Instead there must be some interethnic peace, based on national solidarity and integration. Any “privileged minority”—it does not matter whether it is privileged areas, or privileged ethnic groups or clans—is totally unacceptable. They destroy the unity and integrity of the country, contrary to fundamental democratic principles. Third: prior to its social reconstruction the North Caucasus must be completely returned to the Russian political and legal field. There should not be and never will be any political and legal vacuums in Russia. Russia should return to the Caucasus and the Caucasus should return to Russia. Fourth, do not be afraid to debate on the national question, but debate must be led by responsible and competent people who are authoritative representatives of the various peoples and Diasporas. And most importantly, there is a need of “re-nationalization” of the Russian people. There needs to be a restoration of the instinct of Russian peoplehood. Without the Russian people—who are a repository of Russia’s historical memory—and their great Russian culture the unique and diverse Russian civilization would be impossible. The sooner we move in this direction, the more quickly and painlessly it will be.